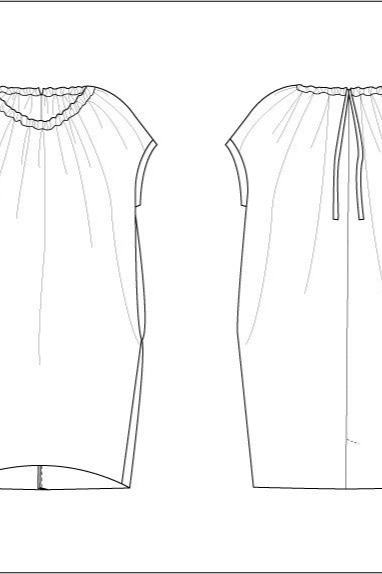 Quick, easy and stylish dress sewing pattern that’s perfect for beginners! The Claire dress is loose-fitting, relaxed, oversized and elegant dress and is a unique take on the little black dress. It has unusual seam lines that wrap from back to front. A neckline drawstring provides drama and interest and can be adjusted as you style your look. For maximum comfort, the Claire dress features roomy side seam pockets, and is easy to sew and has fully illustrated detailed sewing instructions. Techniques used in this pattern include slip stitch, edgestitching and narrow rolled hem. Make your dress from light to medium weight fabrics like challis, raw silk, gauze or charmeuse for a soft drapey look or sew sew from crisp cotton, gingham or linen for a more structured feel. Available in sizes X-L (see webiste for bust, waist and hip measurements).